The final stop on our Boyle Heights crawl brought us to El Sarape. Named after the brightly-colored shawls of Mexico, the seafooder is the work of one Maria Benitez, who comes to us from the town of Tecuala in Nayarit. Upon entering, you'll find a light, bright, beachy sort of affair, the kitchen as far as I can tell. The actual seating area's out back, and recalls something that you might find in a Boyle Heights backyard. Note the tablecloths, which recall the restaurant's namesake blanket. 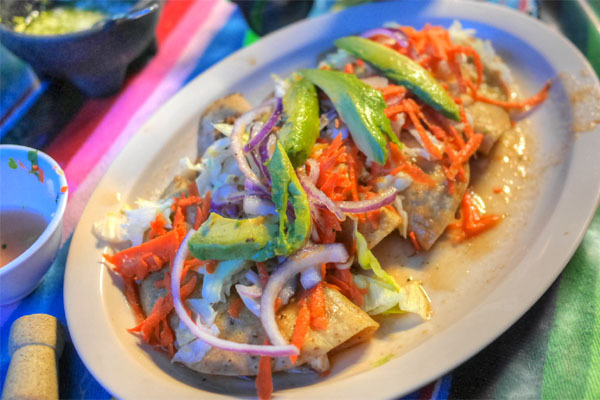 El Sarape's menu is seen on a large plastic sign overhanging the dining room. Click for a larger version. 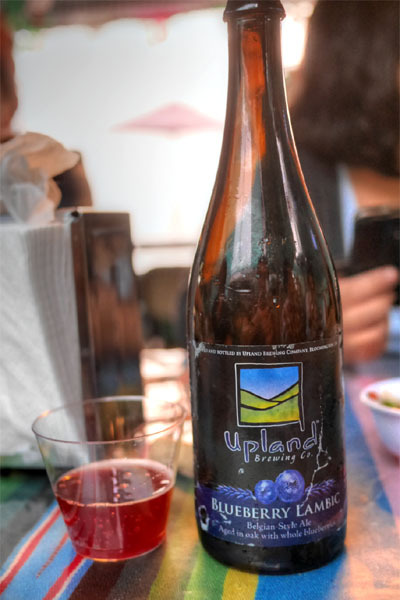 BYOB was a must of course, and I commenced with the 2015 Upland Blueberry Lambic, a Belgian-inspired sour aged in oak for over a year with whole Huber Orchard berries. Think tart, funky, and acidic, with a slight fruit presence creeping in on the midpalate. 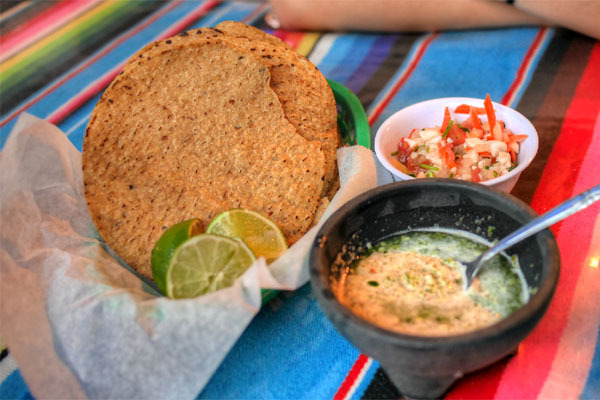 Complementary "chips" were served with a fish ceviche and a thin-but-bracing salsa verde. We ordered the tacos dorados de camaron, but these came out for some reason (I'm not sure if they ran out, misheard me, or what). They were tasty enough, delightfully crispy with some brightness from the vegetables on top, though I would've liked more seasoning on the actual fish. 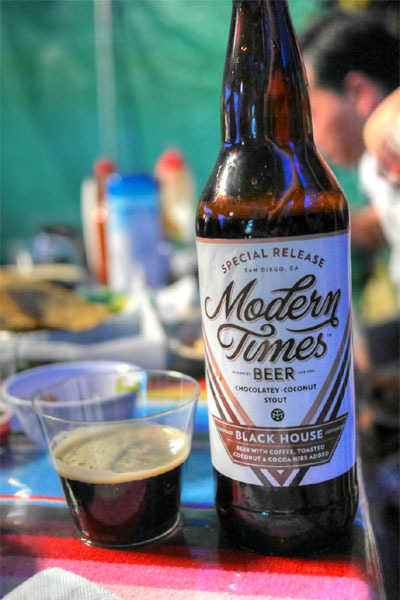 Next to drink up was the 2015 Modern Times Black House with Coconut and Cacao Nibs, a delicious blend of chocolate and coconut flavors over a base of roasty stout. The overall effect recalled a Mounds bar. Yum. 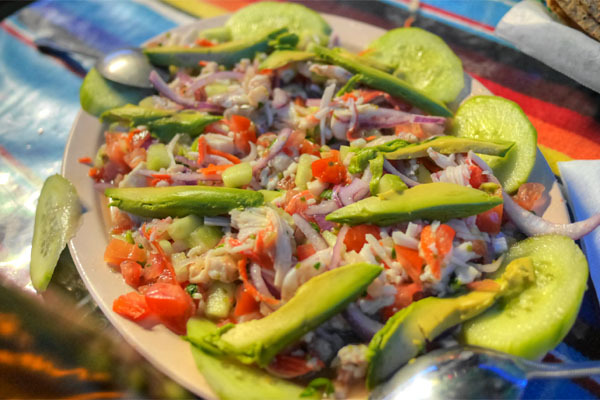 The mixed ceviche was nice, with lots of different tastes and textures going on, all set against the tartness of the marinade while the avocado lent a bit of lushness to the dish. The use of carrots is somewhat surprising, but apparently it's commonplace in the Chef's hometown. 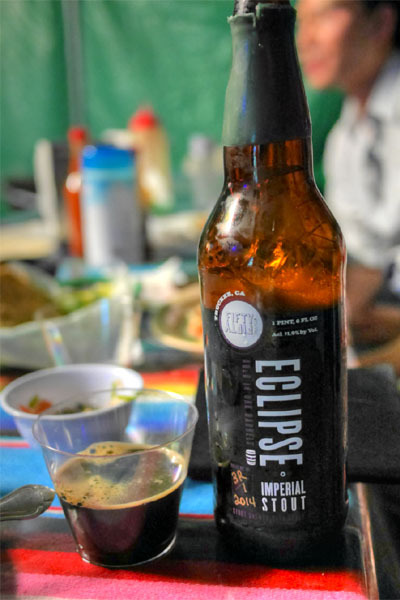 The 2014 FiftyFifty Imperial Eclipse Stout - Heaven Hill Rittenhouse Rye was our final tipple, a stout brewed with honey and aged in oak rye whiskey barrels. Think classic notes of roasty malt, coffee, and molasses, with the sweet spice of the rye barrel coming through quite clearly. 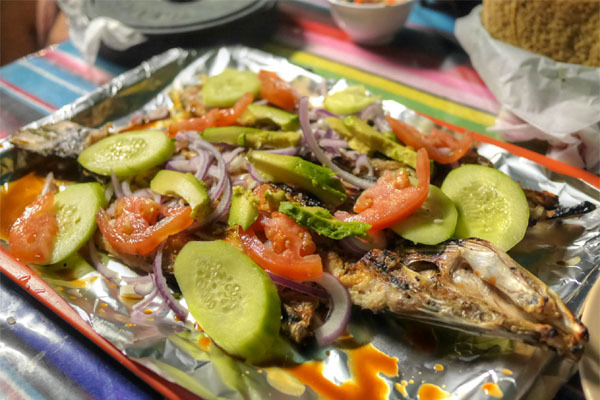 Finally, we experienced El Sarape's take on pescado zarandeado, a dish that most of us probably know from Coni'Seafood. This was a commendable rendition as well, with the fish arriving tender, moist, and flaky, its inherent brine amped up by some deeply spicy, savory flavors. Tasty, and a good match for all the veggies piled up top. 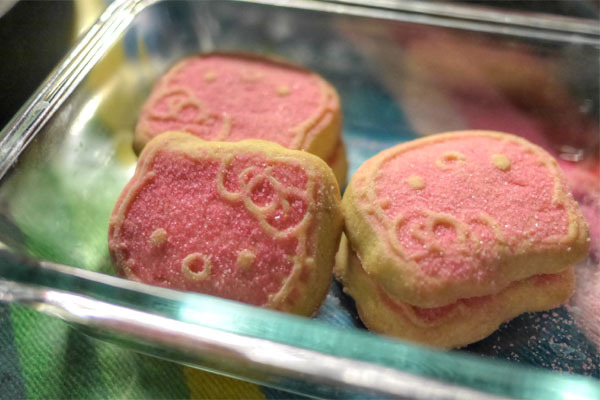 And for dessert: Hello Kitty head shortbread cookies. I feel like we didn't give El Sarape a proper go, firstly because we were quite full by this point (we went to three restaurants prior to this: Mariscos Jalisco, La Estrella, Las Molenderas), and secondly because we probably didn't order enough (or order the rights things). There is promise here though.